Young entrepreneurs have been set the challenge of thinking ‘smart’ when developing their business ideas for a competition designed to inspire enterprise skills among schoolchildren. 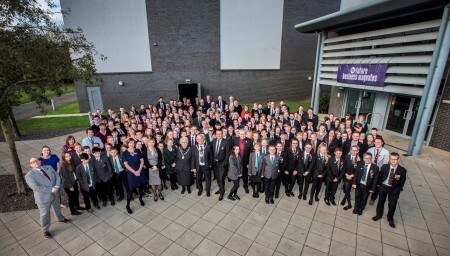 Future Business Magnates (FBM) – an annual competition run by Business Durham, the economic development organisation for County Durham – will this year challenge Year 8 children from across County Durham to devise a smart solution to a problem they have identified in the region. The competition launched today (THURS 2 NOV) at Newton Aycliffe’s Xcel Centre. Its theme ‘Smart County Durham’ will encourage pupils aged 12 and 13 to use resources and do research to create a product or service which would make a positive difference to the way we live or work. Influential names from the business world, including Bignall Group, Ebac, Hydram, Waterstons, CA Group, Robertsons Construction, Hodgson Sayers and Thorn Lighting, are partnering the 18 school teams to provide mentoring and support. Sarah Slaven, interim managing director of Business Durham, which works on behalf of Durham County Council, said: “We’re looking forward to seeing pupils come up with their smart solutions as, in the past, they’ve proved that their imagination has no bounds. It’s only by innovative thinking that we’ll be able to develop the new products of the future. Quote from DCC: “Cllr Carl Marshall, Durham County Council’s Cabinet member for economic regeneration, said: “We’re really looking forward to seeing the next generation of business leaders and entrepreneurs bring their youthful enthusiasm and creativity to the challenge. Over the next eight months, around 180 pupils will attend a series of specially designed workshops and work with their mentors to develop a business idea, create a prototype and understand how to market and finance their product or service. The six challenges of the programme will be judged by leading lights at the FSB, Karenic Communications, The Interface, This is Creative Enterprise, Atom Bank and Short Richardson Forth law firm. Pupils will present their finished concept to the judges and winners will be announced at an awards ceremony in June next year. FBM has helped develop the business acumen and creative flair of hundreds of secondary school children since it was first established in 2005. The theme for last year’s FBM competition was Connecting County Durham, with pupils at Ferryhill Business and Enterprise College taking home top prize for their eco-based board game ‘Fear the Wear’.